Our kitchen transformation is coming along very nicely, particularly as it's being performed by two people who have no DIY experience beyond painting walls and making wedding invitations; ripping up floors and stirring cement is quite a different ball game, as you can imagine, though I think we're holding our own fairly well. The floor is almost finished and we will spend a scintillating Monday evening adding grout, and then the counters are being fitted on Wednesday, which means---hallelujah!---the sink can be dropped in too. Are you asleep yet? Sorry about that. SHIRTLESS MATTHEW MCCONNAUGHEY! There, did that wake you up? I shall bore you all with before and after pictures obviously, though not until we're a lot closer to the after than we are to the before. For now I thought you might like to see how I spent the last few days. 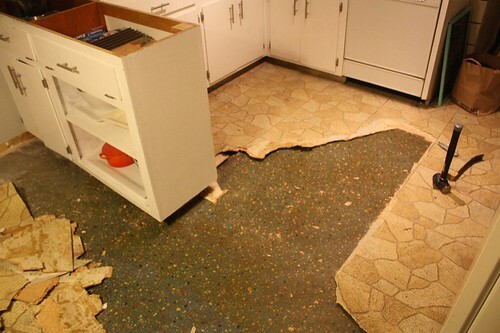 We ripped up the world's most disgusting linoleum to reveal the original 1943 floor, the speckled green monstrosity you see here. Actually, I take that back; monstrosity is too strong a word. If this were a dress, I would totally wear it, but only with red lipstick and pincurls. It kind of goes against my entire code of ethics to show you this---it's so messy! And gross!---but I want you to really, really see what I'm working with here. No floor, no counters, no backsplash, and no sink. But look, we have a mighty fine orange extension cord. Of course, this would be the weekend I had to bake something for the charity bake sale at work on Monday---Sheetrock Surprise, anyone? Cupcakes topped with just a sprinkling of tile dust?---and so, in the absence of an oven (or any real surfaces on which to roll or mix or stir), I opted for the no-bake, four-ingredient Chocolate Biscuit Cake that won me first prize in the aforementioned bake sale three years ago. An oldie, sure, but a goodie. You should make that recipe immediately. You don't even need a kitchen to do it. On the upside--super congrats for tackling it on by yourself with what seems to be very little experience. Go Team Newbies!! I kind of love the original 1943 flooring - I'm sure its worse live and up close. I'M EATING THE BISCUIT CAKE RIGHT NOW!! Also, you two amaze me. I am excited to see how this turns out! 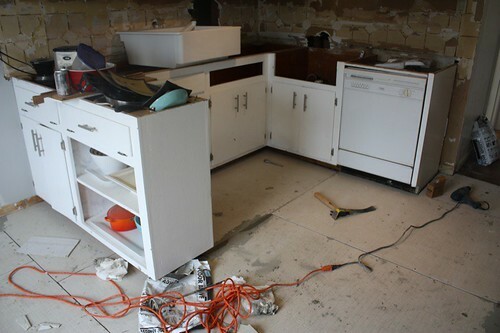 Living vicariously through you, as my own dated kitchen needs to be demo'd & redone. Aw, this brings back sweet memories of this summer. We lived without a kitchen (microwave and fridge in the livingroom!) for almost a month! But we managed to redo our whole kitchen, walls, floor and fittings and now it's so great to cook in a kitchen we've built. Also, I'm Norwegian and here we love gray tile :) Let me know if you need translations beyond what Google can do! Hey, I like the 1943 floor! And, talk to me when you've been seven months without a kitchen (the cabinets were custom and worth the wait). Four days? Psshh. Looks like it's coming along well! Home ownership is so glamourous, isn't it? Until very recently, I had a large blue porta potty in my front yard. And, PEOPLE USED IT. I love the 1943 floor! Was it too damaged to keep? Are you keeping the cabinets? It looks like a good layout. I'm glad you got rid of that awful tile countertop! yeah, i kind of liked the original speckled floor, too. what was it made of? I bet peeling potatoes in the bathroom is getting a little old by now. 1. Melt 1 cup of peanut butter and 1 cup of butter and mix together. Let cool slightly while doing step #2. 2. In a separate bowl, sift together 2 cups of powdered sugar and 2 cups of crushed graham crackers. Do not make the mistake of skipping the graham crackers unless you want totally soft bars that you can't pick up. 3. Add the sugar mixture to the peanut butter mixture, then spread into a lined 9x13 pan (you can also use a 9x9 brownie pan which will just make the bars slightly thicker). Refrigerate for 1 hour. 4. Melt 1 1/2 cups of chocolate chips and spread on top of cold peanut butter mixture. Put the pan back in the refrigerator for 1 hour to let the chocolate set. 5. Remove pan from refrigerator and let peanut butter barzzz sit at room temperature for 15 minutes before cutting into bars (otherwise the chocolate cracks). Store the bars in the refrigerator.